A standard kayak is fitted with a High performance seat, except the Explorer LV, Greenlander and Greenlander Pro that all come with a foam seat. Should you want the standard or small size high performance seat please let us know when ordering. The standard kayak also comes with a back rest, footrests, all recessed deck fittings, deck lines and a wire skeg. A rope skeg can be fitted instead for no additional costs if requested. The standard kayaks are available in yellow, orange, red, blue, quill, white and bright green. Please use the RAL colour chart to see which colour you prefer. The standard kayaks are made of fibre glass and are constructed from chop strand matt, woven cloth and polyester resin. We use a quality control mat and not a chop strand gun to laminate the hull. Due to the shapes in the deck providing extra stiffness, the deck is a slightly lighter lay-up than the hull. The standard lay-up has been designed for all levels of kayaking and is ideal for the kayaker who really wants a durable kayak and is not too fussy about weight. The kayak will also come with an internal reinforced keel, and internal and external glass seams. The approximate weight of an Explorer made of fibre glass is 25-26 kilo including hatch covers etc. Standard kayaks have the choice of a High performance glass seat or a foam seat. 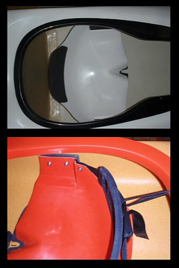 The high performance seat (standard since 1/3 2009) is slightly tilted forwards for a more positive and dynamic paddling position. It has been designed to improve the paddler’s posture and in turn will help the paddler achieve a more efficient forward stroke. 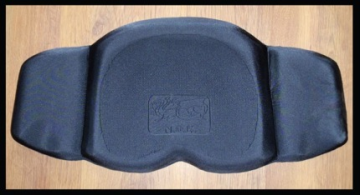 Hip pads are provided and full foam pads are placed under the seat. These stick to the hull, come in different heights and will stop stones getting trapped between the seat and the hull. The rear of the seat comes higher up supporting the paddler’s lower back. The raised area also prevents the bottom being pinched between the back of the seat and the back rest. The seat comes with a built in lower back support, but can also be supplied with an optional extra backrest. This allows both lower back support and a narrow back band so support can be given even if the paddler is leaning forward. The High Performance glass seat comes in two widths. The narrower seat being suitable for the small or slimmer paddler size 8-10 down in UK female sizes (US: size 6-8. Europe: size 36-38), and approx 30″ waist in male sizes (US and Europe: size small). The wider seat will always be fitted unless a narrow seat or foam seat is specified. As standard it comes set in the middle position and can be set 12 mm (½″) forward or backward by the paddler depending on their needs. In our factory it can also be set higher if required, at least 25 mm (1″). With a bit of drilling and by purchasing some extra pads from us, it can also be set higher by the paddler. The High performance seat is also available as a retro fit kit. This comes complete with all the fittings and instructions to fit into any of our boats. The back rest is fully adjustable. The adjustment buckle is situated in the centre of the back rest. Our new seats (from 2009) offers support to the lower back and at the same time allows the higher, narrower back rest to be adjusted so the paddler’s back can be supported when leaning forwards. Fibre glass & plastic boats come with aluminium Yakimma footrests as standard. The wire skeg from Kari-Tek is standard in our kayaks as most people find it has the most suitable mix of ease of use and maintenance. The skeg blade is a simple blade that pivots at one end. All standard kayaks have a moulded fibre glass skeg box. The wire slider control box is fitted in the seam, not in the way and easy to use. We have chosen to use the larger, round hatches as these tend to be more water proof than the oval ones. The SILVA 70P compass fits in the recess, but the compass itself has to be ordered separately. All deck fittings are recessed so they will not catch on equipment or damage other kayaks during rescues. If you would like a custom colour, you can get a rough indication of how your colour scheme will look like by using the colour chooser on the Sea Kayaking UK website. When you have decided the colours from the colour chooser, please select the RAL colour. As monitors may show colours differently, especially darker shades, you may want to check your choice on a printed RAL chart. Click here for pricing. When ordering a custom bulkhead, please provide the measurement from the front edge of the keyhole cockpit to the front bulkhead. The bulkhead will be fitted vertically unless otherwise stated upon ordering. Please note that the bulkhead is fibre glassed on one side only. When ordering a foot pump (Henderson) we will add 4 inches (10 cm) onto the inside leg measurements you supply. Click here for pricing. The custom kayaks are fitted with the standard kayak’s wire or rope skeg. Sea Kayaking UK offers a variety of compasses that can be fitted to the kayaks. 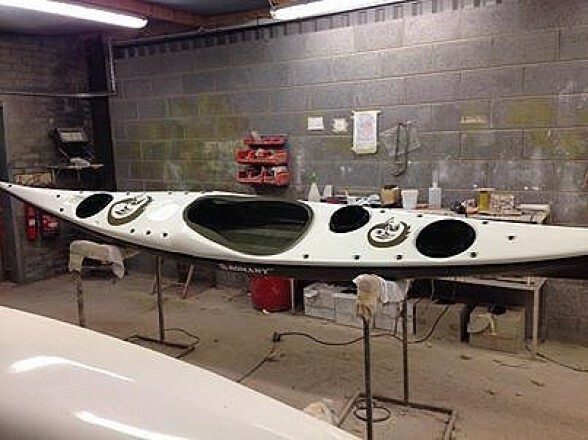 If a custom kayak is ordered, the compass recess can be fitted to your requirements. Click here for price. New! Oval back hatch and small deck hatch. 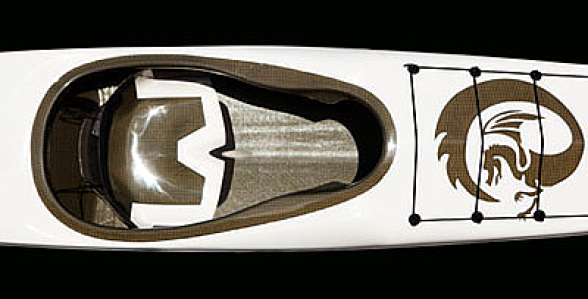 The Elite kayaks are made of fibre glass with a lighter overall lay up than the standard kayaks. This makes the Elite kayaks approximately 3 kilos lighter than the standard kayak. With reinforced keel and stress areas on deck and hull this is still a fairly strong kayak, but not as strong as the standard kayak and requires more looking after. The stronger a kayak is needed, the heavier it will have to be. The Elite lay up is far easier to repair than the carbon-kevlar construction. The kayaks come with internal and external glass seams. The approximate weight of an Elite Explorer is 22 kilo including hatches etc. These kayaks are constructed out of vinylester resin using a carbon-kevlar hybrid cloth. The exact specification of the construction will depend on the intended use of the kayak. The kayak comes with internal and external seams. If the kayak is needed for flat water use, a very light construction can be appropriate. This will make a very light kayak. The carbon-kevlar lay up is not as easily repaired as the Elite lay up. If the kayak is needed for advanced conditions, a higher specification of carbon-kevlar is needed. The stronger a kayak is needed, the heavier it will have to be. A carbon-kevlar kayak can, however, be up to 3 kilos lighter than the Elite lay up. The approximate weight of a carbon-kevlar Explorer is 20-21 kilo, but could be as low as 18-19 kilo including hatches etc. This is a good compromise offering carbon-kevlar deck over a glass hull. The carbon-kevlar makes the kayak lighter while the glass hull ensures it is as robust as a standard glass kayak. The approximate weight of a carbon-kevlar deck over a standard glass hull is 23 kg including hatches etc. For centres and clubs that need even stronger kayaks than our standard kayaks, due to daily abuse year after year, we construct fibre glass kayaks on a heavier specification. This creates heavier and even stronger kayaks. The approximate weight of the fleet kayak is 26-27 kilo including hatch covers etc.